Scotland is the place where … I chose to live. Took me a while, but I got there eventually! It’s the typical story really, a bit like when you fall in love. Usually you meet your first love close to you, at a young age; sometimes you’ve even known her forever. For me, her name was France and she was reassuring and familiar - although a bit grumpy at times. Lovely but too close, too comfortable. Then you kind feel you need to move on, and here comes the second love of your life – suddenly it’s a better relationship; you know yourself better, you mature as you get a bit older. Her name was Canada and boy did she teach me a lot about myself. Oh, Canada… I feel like I used you and left when I became a proper grown up… She’ll always be the one I’ll be thinking of with a smile on my face. But a smile is not enough. Then you get cocky and start using Tinder… It’s fun, it’s short term, it’s quick, it’s sometimes very exotic , non-committing and exciting - but not always fulfilling. But hey, you gave it a try. Why not? And then, only then, you meet the one; the right one, the last one. Her name is Scotland and I love her to bits. She’s the best of both worlds; she’s beautiful beyond belief and most importantly, we share the same core values. And guys, this is the best feeling in the world. This sense of solidarity, this ideal of togetherness. She makes me feel I am where I am supposed to be. She’s not perfect you know, but man she tries hard. Scotland is simple and obvious. She’s just pure dead brilliant. I understood Scotland is the place where I want to spend the rest of my life the day some of my Scottish friends gently convinced me to wear a kilt for a wedding. I thought I would be a fraud, I thought I shouldn’t steal other people’s culture. I thought this wasn’t for me. “French people don’t wear kilts”, my judgmental little old brain told me immediately. But then I understood you can’t steal something people want to share. And then boom, I knew it. Simple, obvious. Scotland is the place I chose to love. But really, it wasn’t a choice… Ask anyone who experienced love at first sight and you’ll understand how sometimes you don’t even have to try, it’s just right there in front of you; ready. Sounds absolutely ridiculous with a French accent by the way... But I am working on it. Love works both ways, right? I guess I'll just have to stretch my arms out wide and embrace this new open relationship! Everyone's welcome so long as no-one tries to share my food. And I don't really do hugs either, I blame my staid Presbyterian upbringing! That's a lovely heartfelt post Julien. I'm from the Western Isles and have always been very spoiled in terms of where I live. Sometimes it takes someone from outside the country to come in and remind me how lucky I am! I also fell in love with this beautiful country at the same time as I was falling in love with husband and have now adopted Scotland as my home. I hear ya in every sense on this post- what a wonderful articulation. Hailing from the Emerald Isle I also fell in love with Scotland, and a Scot! And I am proud to call Scotland home (although my mum still gets annoyed if I don't call Belfast home). Currently on a train down from Perth enjoying the beautiful view of Big Tree Country out the window The simple things! @julienmanu If you weren't already in love with Scotland I would have french-kissed you after that lovely post! Having moved over to Scotland many moons ago i completely get what you are saying. Love this country and the people and the random and lovely chats you can have with folk here. Scotland is where I was born! @ArgyllCoffeeGod - that's totally the best reason! Hahah love this @julienmanu - and very recognisable !! @julienmanu hahaha excellent post! can't wait to hear you attempt 'Whit’s fur ye’ll no go past ye' in your French accent! @julienmanu , I can totally relate to this beautiful description of what Scotland means to so many of us, not born here but calling this place home. The home that you willingly choose to build. Born in Spain and being Iceland my first love, Scotland became my true love over a decade ago. First you like certain things: landscape, people, music... and then you get hooked and just can't be away for too long, despite the weather! I am grateful for the hundreds of magical moments I have lived here and proud when people say I have a bit of a Scottish accent. I have always felt welcome (I still do) and no matter what the future may bring, Scotland will always be part of who I am. Alba gu bràth! Men can wear 'skirts' (the Kilt!) as the norm and with pride! I have been living in Scotland for almost 7 years, I really love this beautiful country, its wonderful people,its amazing traditions. And KILT! I adore to see men in kilts. It's so unusual and so SCOTTISH!! And though I am from a very beautiful Russian city St Petersburg,where I was born and lived, I can definitely say SCOTLAND IS UNIQUE!!!! Scotland is my home - a country I have deep, unbreakable ties to. I adore the landscape and the tranquillity you can find in it. I love the shifting light and beautiful colours. And bone of my bone. And caressed by the rain. I haven't been out of Scotland for about 20 years I think! I love our wild free landscapes and I actually do love our weather! It's our rain that gives us our lush green countryside, beautiful plants, flowers and trees. We always have fresh water coming out of our taps every day. So I try not to complain about the rain too much lol. I think my love of Scotland was embedded many moons ago when I was younger. My parents used to take me and my sister on holiday to Scotland almost every year until we were 16. When I met my partner, he and I began walking, first in the Lake District and then visited the highlands and immediately felt at home. It was so hard to describe, but almost as it a wave of calm washed over me and I felt so relaxed. I behave like an excited kid when holidays are coming and get goosebumps when we go on holiday there, and I'm always gutted when we have to leave. eeeek, we leave this Saturday morning for a week in Ardmair and I can't stop smiling just typing that!! @Samantha_Grant is that Camus nan Geall? @Samantha_Grant did you go down and see the ancient chambers? Exactly three years ago today, I arrived in Edinburgh with two large suitcases, not knowing a soul and not knowing much about Scotland besides some of the classics like kilts, haggis and bagpipes, but I was ready to get to know the country and stay here for a year. 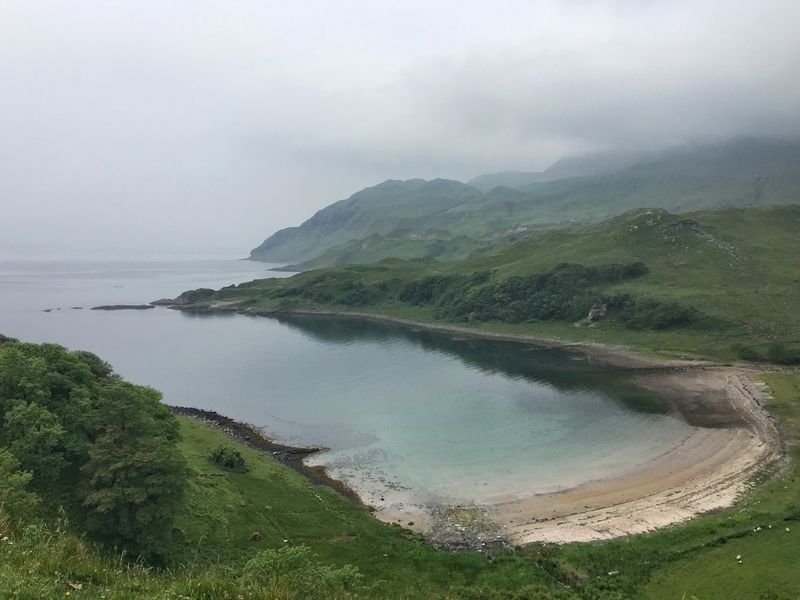 As time passed, I realised that I wasn’t ready to go back home to Denmark – I wasn’t done exploring Scotland and that is why I’m still here- three years later. Sounds like your heart is where your home is @Mark1966 . I'd love to walk the West Highland Way. I was hoping to try it next year, but I need to get into the long walking training! As for walking the whw its all about planning. I stayed in 2 self-catering houses...one near Drymen and one in North Ballachulish...and used them as a base for a family holiday so i got dropped off and picked up later on. Meant we could still do things later on as and when we wanted to. If you don't already know it, I think you'll love one of my own favourite Burns songs called Ca' the Yowes. I remember singing it in a competition at the Edinburgh International Festival when I was a Wee child in primary school and it has been a favourite of mine ever since as it's so moving. I too fell heavily in love with Scotland...at the tender age of 14. First holiday there in 1974. It poured with rain for 10 whole days, but my heart was stolen by the wild beauty, serenity and people. I go every year more than once. I got married there and celebrate our anniversary in no other place. One day I'll live there. I will. Even if only as ashes deposited in Findhorn Bay to come in and out on the tide.